Rare finds have prompted archaeologists to rewrite the history of an ancient north Pembrokeshire stone. The Trefael Stone, a scheduled ancient monument in a Nevern field, was originally thought to be an ancient standing stone, but is actually the capstone of a 5,500-year-old tomb, according to new research from a Bristol University archaeologist. Dr George Nash and colleagues’ excavations at the site indicate that the 1.2m high stone once covered a small burial chamber, probably a portal dolmen, Wales’ earliest Neolithic burial-ritual monument type. Did agriculture in Stone Age Europe rise and spread through the gradual transfer and diffusion of the farming idea from agriculturalists to hunter-gatherers, or was it brought as a package by migrating agriculturalists? Was agriculture introduced from south to north, as the archaeological record suggests, or did it come from a different direction? A joint Swedish-Danish research team may have finally found some answers. Under the leadership of Assistant Professor Anders Götherström of Uppsala University, Sweden, and Assistant Professor Mattias Jakobsson, also of Uppsala University, researchers used advanced DNA techniques to study four skeletons of humans who lived in Sweden during the Stone Age, about 5,000 years ago. They analyzed the ancient remains of three hunter-gatherers of the Pitted Ware Culture , excavated on the island of Gotland, Sweden, and the remains of a farmer, a member of the Funnelbeaker Culture, excavated at Gökhem parish, also in Sweden. Analyzing DNA from four ancient skeletons and comparing it with thousands of genetic samples from living humans, a group of Scandinavian scientists reported that agriculture initially spread through Europe because farmers expanded their territory northward, not because the more primitive foragers already living there adopted it on their own. The genetic profiles of three Neolithic hunter-gatherers and one farmer who lived in the same region of modern-day Sweden about 5,000 years ago were quite different — a fact that could help resolve a decades-old battle among archaeologists over the origins of European agriculture, said study leader Mattias Jakobsson, a population geneticist at Uppsala University in Sweden. The hunter-gatherers, from the island of Gotland, bore a distinct genetic resemblance to people alive today in Europe's extreme north, said Jakobsson, who reported his findings in Friday's edition of the journal Science. The farmer, excavated from a large stone burial structure in the mainland parish of Gokhem, about 250 miles away, had DNA more like that of modern people in southern Europe. 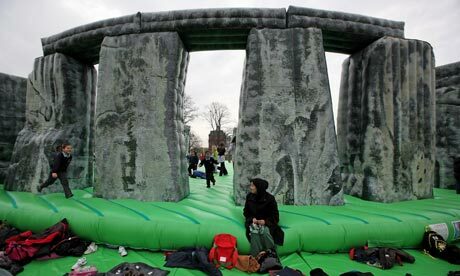 "It's a bit weird and random," says Michael Mclaughlan, 50, bopping gently up and down in the middle of the giant inflatable Stonehenge that has sprung up on Glasgow Green. "They should get Alex Salmond down here to bounce about." Around him, children and adults are discarding their shoes and climbing tentatively on to the grandest of bouncy castles, a large-scale interactive work by the Turner prize winner Jeremy Deller. Titled Sacrilege, it's Deller's first major public project in Scotland and a centrepiece of the Glasgow international festival of visual art which launched on Friday. "It's something for people to interact with, it's a big public sculpture," says Deller, who was on hand for the project's launch. 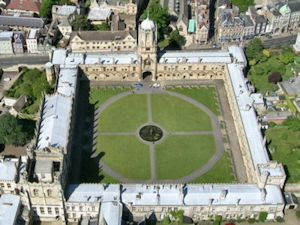 "It is also a way of interacting with history and archaeology and culture in a wider sense. When human ancestors began scavenging for meat regularly on the open plains of Africa about 2.5 million years ago, they apparently took more than their fair share of flesh. Within a million years, most of the large carnivores in the region—from saber-toothed cats to bear-size otters—had gone extinct, leaving just a few "hypercarnivores" alive, according to a study presented here last week at a workshop on climate change and human evolution at Columbia University's Lamont-Doherty Earth Observatory. Humans have driven thousands of species extinct over the millennia, ranging from moas—giant, flightless birds that lived in New Zealand—to most lemurs in Madagascar. But just when we began to have such a major impact is less clear. Researchers have long known that many African carnivores died out by 1.5 million years ago, and they blamed our ancestor, Homo erectus, for overhunting with its new stone tools. But few scientists thought there were enough hominins—ancestors of humans but not other apes—before that to threaten the fierce assortment of carnivores that roamed Africa, or that the crude stone tools that our ancestors began to wield 2.6 million years ago could be used for hunting. Besides, it was probably much more dangerous for the puny hominins alive then, such as Australopithecus afarensis, whose brain and body were only a bit bigger than a chimp's, to grab carcasses than it was for supersized carnivores such as giant hyenas, cats, and otters to devour hominins. "One of my favorite images is of an Au. afarensis being dragged down by a giant otter," says vertebrate paleontologist Lars Werdelin at the Swedish Museum of Natural History in Stockholm. Specialist scanning equipment at a hospital's spinal unit is being used to shed light on early Bronze Age burial discoveries. The items unearthed on a Dartmoor burial site in Devon could prove to be one of the most important archaeological finds of the last 100 years. The excavation, co-ordinated by Dartmoor National Park Authority, discovered the collection of early Bronze Age remains in a burial cist - a stone chest containing the ashes and belongings of a dead person - on Whitehorse Hill last year. 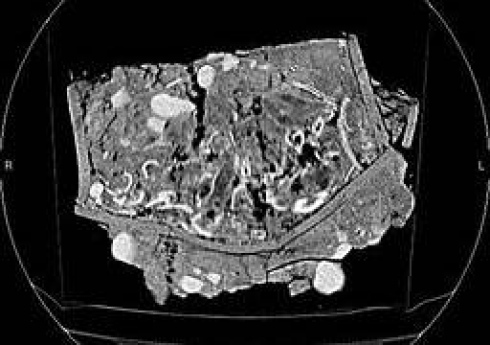 Now, under the expert eyes of Wiltshire Council's conservation service the items are being X-rayed to see what secrets they may be hiding. As human ancestors rose on two feet in Africa and began their migrations across the world, the climate around them got warmer, and colder, wetter and drier. The plants and animals they competed with and relied upon for food changed. Did the shifting climate play a direct role in human evolution? The evidence so far is thin, said Richard Leakey, the renowned paleoanthropologist and conservationist who joined a score of scientists delivering their findings at a conference on climate change and human evolution this week, held at Columbia’s Lamont-Doherty Earth Observatory. Still, a number of scientists are on the hunt. Speakers talked about changes in plants and animals, and how fluctuations in temperature and rainfall would have altered the landscapes. They’re studying what carbon isotopes in soil can tell us about changing plant life and temperature; what hominid teeth suggest about changes in diet; and what sediment cores from the bottom of the ocean have to say about variations in monsoon rainfall. Early Bronze Age remains from a burial site in Dartmoor National Park will be X-rayed at Salisbury District Hospital. The items were found in a burial cist, a stone chest containing the ashes and belongings of a dead person. Senior conservator, Helen Williams, said: "We have a real opportunity to research these finds and potentially discover more about the individual buried there." The items, which include a woven bag, will be scanned at the spinal unit. Are We Sliding Backward on Teaching Evolution? Tennessee was the center of the national debate when it prosecuted John Thomas Scopes for the crime of teaching evolution. Now, 87 years after the Scopes “monkey trial,” Tennessee is once again a battleground over the origins of man. This month, it enacted a controversial new law — dubbed the “monkey bill” — giving schoolteachers broad new rights to question the validity of evolution and to teach students creationism. Unlike those bills, Tennessee’s “monkey bill” is now law. School boards and education administrators are now required to give support to teachers who want to “present the scientific strengths and scientific weaknesses” of various “scientific theories,” including “biological evolution” and “the chemical origins of life.” The new law also supports teachers who want to question accepted scientific thinking on two other hobgoblins of the far right: global warming and human cloning. Nationally important pre-historic remains unearthed on a Dartmoor burial site are to be x-rayed by Wiltshire Council conservation experts at Salisbury District Hospital tomorrow (Tuesday). An excavation, co-ordinated by Dartmoor National Park Authority, discovered an important collection of Early Bronze Age remains in a burial site situated in Dartmoor National Park. The discovery could prove to be one of the most important archaeological finds of the last 100 years. Wiltshire Council’s Conservation Service has been brought in to cast its expert view on the finds. Image from Hands Cave, World Heritage in Patagonia. Carnivory is behind the evolutionary success of humankind. When early humans started to eat meat and eventually hunt, their new, higher-quality diet meant that women could wean their children earlier. Women could then give birth to more children during their reproductive life, which is a possible contribution to the population gradually spreading over the world. The connection between eating meat and a faster weaning process is shown by a research group from Lund University in Sweden, which compared close to 70 mammalian species and found clear patterns. Learning to hunt was a decisive step in human evolution. Hunting necessitated communication, planning and the use of tools, all of which demanded a larger brain. At the same time, adding meat to the diet made it possible to develop this larger brain. Why is it that humans emerged from the natural world, yet we portray ourselves as modifiers of it, even its adversaries? Paleoanthropologist Rick Potts thinks that fluctuations in the environment in which our ancestors lived were responsible. Our ancestors responded by becoming more versatile through a suite of changes that included an ability to modify our environment. Potts' theory is known as the variability selection hypothesis. Human ancestors adapted "to novelty and to change itself," he told an audience here at a conference on climate change and human evolution at Lamont-Doherty Earth Observatory yesterday (April 19). The origins of the iconic Irish red deer was a controversial topic. Was this species native to Ireland, or introduced? 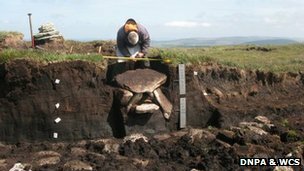 In a new study that was published 30 March 2012 in the scientific journal Quaternary Science Reviews, a multinational team of researchers from Ireland, Austria, UK and USA have finally answered this question. By comparing DNA from ancient bone specimens to DNA obtained from modern animals, the researchers discovered that the Kerry red deer are the direct descendants of deer present in Ireland 5000 years ago. Further analysis using DNA from European deer proves that Neolithic people from Britain first brought the species to Ireland. Although proving the red deer is not native to Ireland, researchers believe that the Kerry population is unique as it is directly related to the original herd and are worthy of special conservation status. Whatever went on there, it would have impressed the ancient Britons. Even if it was only whispering. Salford's clever academics, who once took me shopping in a virtual supermarket – you sat in an armchair wearing a helmet and a glove – have now recreated the sound of Stonehenge. An ancient megalithic structure shaped like a ship in Sweden seems to have a similar geometry to Stonehenge, and may have been used as an astronomical calendar, one scientist says. Ancient Scandinavians dragged 59 boulders to a seaside cliff near what is now the Swedish fishing village of Kåseberga. They carefully arranged the massive stones — each weighing up to 4,000 pounds (1,800 kilograms) — in the outline of a 220-foot-long (67-meter) ship overlooking the Baltic Sea. Archaeologists generally agree this megalithic structure, known as Ales Stenar ("Ale's Stones"), was assembled about 1,000 years ago, near the end of the Iron Age, as a burial monument. But a team of researchers now argues it's really 2,500 years old, dating from the Scandinavian Bronze Age, and was built as an astronomical calendar with the same underlying geometry as England's Stonehenge. A series of burial mounds have been excavated — thought to represent an ancient barrow cemetery — at Bankhead of Kinloch near Meigle. Both the village and the surrounding area of Strathearn have proved a treasure trove of Pictish sites and artefacts over the years. Despite the increase in the identification of these sites through aerial photography surveys since the 1970s, they are still generally rare and so are of immense significance. 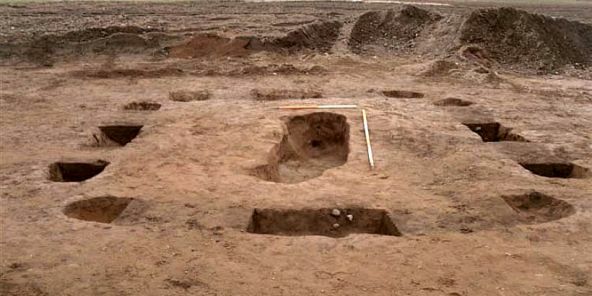 Experts say the Meigle project represents the first complete excavation of a barrow cemetery to date, providing a unique opportunity to comprehensively analyse the monument. University of Cincinnati research is revealing early farming in a former wetlands region that was largely cut off from Western researchers until recently. The UC collaboration with the Southern Albania Neolithic Archaeological Project (SANAP) will be presented April 20 at the annual meeting of the Society for American Archaeology (SAA). Susan Allen, a professor in the UC Department of Anthropology who co-directs SANAP, says she and co-director Ilirjan Gjipali of the Albanian Institute of Archaeology created the project in order to address a gap not only in Albanian archaeology, but in the archaeology in Eastern Europe as a whole, by focusing attention on the initial transition to farming in the region. 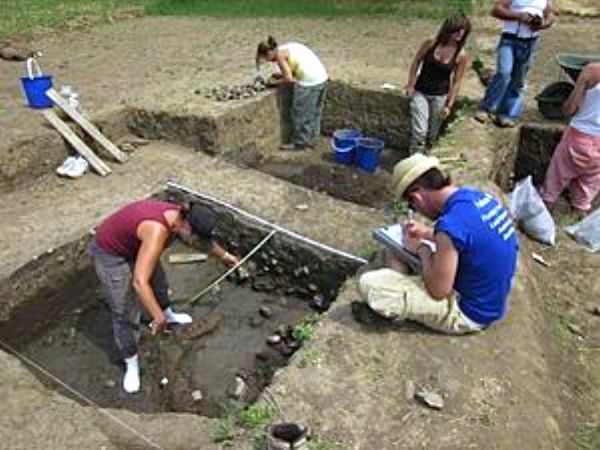 "For Albania, there has been a significant gap in documenting the Early Neolithic (EN), the earliest phase of farming in the region," explains Allen. "While several EN sites were excavated in Albania in the '70s and '80s, plant and animal remains - the keys to exploring early farming - were not recovered from the sites, and sites were not dated with the use of radiocarbon techniques," Allen says. A Bronze Age necklace found in Cornwall in the 18th Century has returned to the county after being housed at the British Museum for more than 150 years. The necklace, known as Penwith lunula, has been loaned to the Penlee House Gallery and Museum in Penzance. 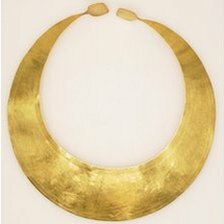 The crescent-shaped gold collar is thought to date back to the early Bronze Age - possibly to 2500 BC. It was discovered in the Gwithian area of the county in 1783 and recorded by local man John Price. Alison Bevan, director of the Penlee, said: "I had butterflies as it was put on display. I recently had a genetic test to find out more about where my ancestors came from. The results confirmed what I already knew - I am from a family of European Jews. But there was also a surprise - a Neanderthal forebear. In many families, there seems to be one person who is interested in genealogy. In my family, it's me. When I was 11, I conducted my very first interview with my grandmother, Ray Zall, who graciously answered all my questions about her childhood in Belarus. It helps that it's an utterly intriguing subject: what defines us as human? But really, Elizabeth Kolbert could make anything interesting, and this feature-length article, ostensibly about the attempt to sequence the Neanderthal genome, uses her trademark personal insight and riveting narrative style. Kolbert so skillfully manages the tricky task of weaving several concurrent stories through the one feature, that the reader is hardly aware of the jumps in a long piece that flows without crossheads or text-breakouts. Through it, she includes a profile of palaeogeneticist Svante Pääbo, the unfolding genetic and developmental story of human evolution, and the creation of fast-throughput genetic analysis, all infused within the central philosophical and scientific question of what it means to be human. Why are we so special? What enabled us to take over the world while our cousins are caged in zoos or extinct? The simple act of walking continues to take strange detours among ancient human ancestors. To wit, 1.5 million-year-old footprints excavated in Africa, initially thought to reflect a thoroughly modern walking style, were instead made by individuals that walked differently than people today do, researchers reported April 13 at the annual meeting of the American Association of Physical Anthropologists. And findings presented April 12 at the meeting revealed the surprisingly apelike qualities of foot fossils from a 2 million-year-old species that some researchers regard as the root of the Homo genus. These reports come on the heels of evidence that a previously unknown member of the human evolutionary family 3.4 million years ago possessed a gorillalike grasping big toe and an ungainly stride (SN Online: 3/28/12). Depth measurements of the African footprints, discovered at Kenya’s Ileret site, differ at 10 landmarks from the footprints of people who live in that area today, said graduate student Kevin Hatala of George Washington University in Washington, D.C. Archaeologists have found an entrance to the Iron Age tribal capital of Verlamion, precursor to the Roman city of Verulamium, and five urns, several holding cremated remains, dating back 2,000 years. The ancient items were discovered at former school playing fields on King Harry Lane, currently being transformed into 150 homes. One of the conditions of approval for the Linden Homes development was that archaeologists could investigate the site before it was built upon. The urns have been dubbed King Harry one, two, three, four and five in honour of their burial location. Jackson Njau, a co-director of field research at palaeontological sites in eastern Africa’s Olduvai Gorge, has written in the journal Science of the lack of agreement on interpreting marks on fossil bones and if they were made by stone tools or by biting animals. This is leading to uncertainty over when exactly early hominids began using tools to kill and butcher animals — a fundamental step in human evolution. A close-up of a fossilized zebra bone shows a variety of cuts and grooves, suggesting the difficulty of distinguishing marks made by stone tools from those made by animals. Image: Courtesy of Indiana University. His Science Perspectives article, published in the April 6 2012 issue and entitled “Reading Pliocene Bones,” contends that the “way forward” is through further experimentation, integration of different disciplines to better understand the fossil record, and blind testing of bone samples by researchers and students. Roman remains have been discovered at an archaeological dig at a Cambridge theological college which is planning a £9 million extension. A major project to update and create state-of-the-art teaching and living space at Ridley Hall meant archaeologists were drafted in to carry out a survey. After removing the topsoil the experts from Access Cambridge Archaeology discovered the “tantalising possibilities” of a Roman settlement, and even some remains dating back 3,000 years to the Iron Age. The National Maritime Museum Cornwall will display the 4500-year-old Nebra Sky Disc for the first time in its new exhibition, 2012 BC: Cornwall and the Sea in the Bronze Age. 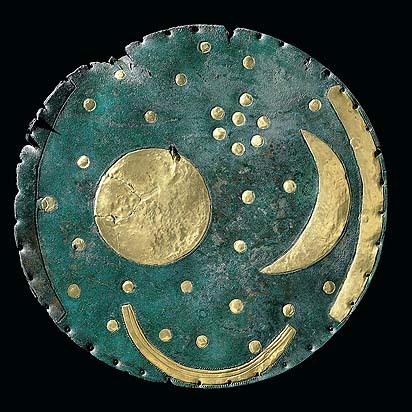 A single bronze disc decorated with gold symbols that represent the sun, moon, stars and a boat, the Nebra Sky Disc is the world's oldest representation of the cosmos. It reveals a prehistoric view of the world that before its discovery had never been known to exist, and has single-handedly reformed our understanding of ancient European history. Greece reopened on Wednesday the Bronze Age site of Akrotiri on the tourist island of Santorini, seven years after its roof collapsed, killing a British visitor. Known as the "Pompeii of the Aegean", the prehistoric town was buried under thick layers of volcanic ash during an eruption 3,700 years ago that may have destroyed the Minoan civilisation in Crete to the south. "One of the most significant archaeological sites in Greece and the world opened its gates again," said Deputy Culture and Tourism Minister Petros Alivizatos. "Akrotiri, which is now fully safe, will attract visitors and boost Greek tourism." 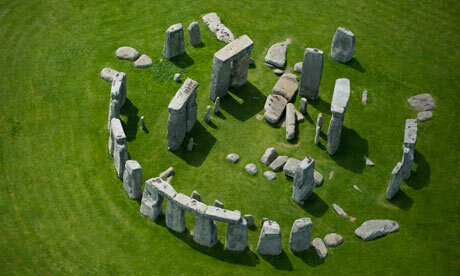 The site was closed down in 2005 after its roof collapsed killing a 45-year old Welsh tourist. A new roof made of steel and wood now shelters the settlement discovered by Greek archaeologists in 1967. 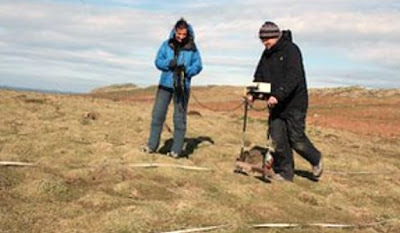 A team of archaeologists have found "hidden" remains of prehistoric buildings and fields on Skomer Island, off the Pembrokeshire coast. Using new technology, they "X-rayed" fields and found buried ditches and structures not visible on the ground. Dr Toby Driver from the Royal Commission on the Ancient and Historical Monuments of Wales said they may date back 5,000 years. For many years it was believed that humans didn’t use fire until about 800,000 years ago. But two College of Arts & Sciences archaeologists have found evidence in South Africa of a man-made fire dating back 1.2 million years, the earliest such discovery. The finding by Francesco Berna and Paul Goldberg substantially pushes back the date that humans laid the first kindling. Berna and Goldberg’s research was published yesterday in the online edition of Proceedings of the National Academy of Sciences. Knowing when man first made fire has huge implications for understanding how our species evolved. Once early man had flames at his command, he not only had a source of heat, but a means to cook food. By unlocking nutrients in food, cooking made for a much better diet that not only boosted overall health, but may have contributed to other modern human traits, such as increased brain size and pair bonding, as the prominent primatologist Richard Wrangham has argued. Berna and Goldberg’s discovery bolsters Wrangham’s theory that our evolutionary predecessor, Homo erectus, was building fires and cooking far sooner than was previously thought.